Layers can play a huge role in the composition of an image. We can read these layers from front to back, or from side to side. Layers can be used to create incongruous juxtapositions, or can create perspective by implying depth. We can guide a viewer’s eye through a composition by relating foreground, middleground and background layers of information. We can relate subject layers to context layers to help an image make its point. While some images are essentially flat, and require no layers, others may use two, three, or even four layers to express meaning. Layers can build substance into an image, enhancing not only its organization but its meaning. Layers can also create coherence by alternating soft and sharp planes of focus. They can even be used to abstract the subject, the final touch in building a delicious sandwich for the imagination – each level adding to the pleasure and substance of the whole. In this gallery, I demonstrate how expressive images can make use of layering to express ideas and stimulate the imagination. 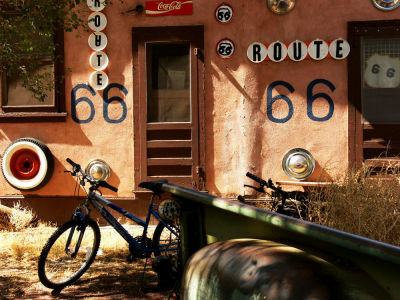 These initial examples were photographed in Santa Fe, New Mexico, USA. More examples will gradually be added to this gallery from future trips. 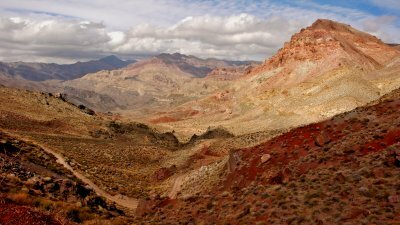 This 27 mile winding dirt road begins near the Rhyolite ghost town, and winds into the National Park through the Grapevine Mountains. This remarkable view is from its windswept crest at Red Pass. It later drops down into a rock-lined gorge. I made this image in the spirit of the romantic Hudson River School paintings of the late 19th century. Using a camera with a 28mm wideangle lens, I anchored these mountains on a layer of red earth. Our road twists and turns below us across the middle of the anchor layer, turning away from us and then vanishing into the center of the image where the second layer begins – a series of rolling mountains that recede in scale as they move from right to left. The final layer is a rich cloudscape extending across the entire image. The colors in this image are as rich and varied as any I have ever made. 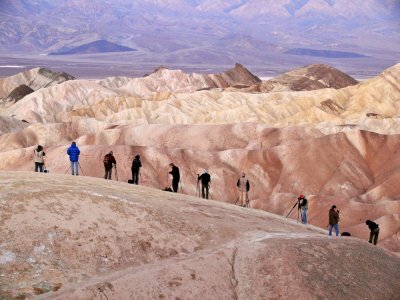 I was photographing the series of richly colored ridges that embrace Zabriskie Point on three sides in overcast mid-afternoon light when I realized that I needed a base layer to make this image work as an expression of color. Normally, I try to avoid placing tourists in landscape photographs. 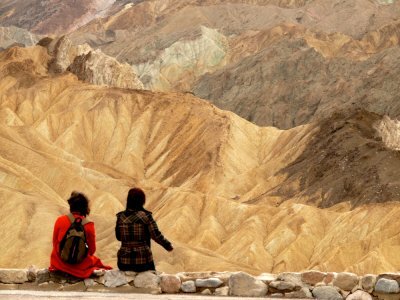 However the red coat of one of these tourists was all about color – and the perfect compliment to the vivid coloration of the ridges making up the next two layers. The backs of the abstracted tourists sitting on the rock wall become my base layer, while the image is completed with two distinctly colored series of ridges in the subsequent layers. The 230 foot high minaret is the highest structure in Morocco's third largest city. 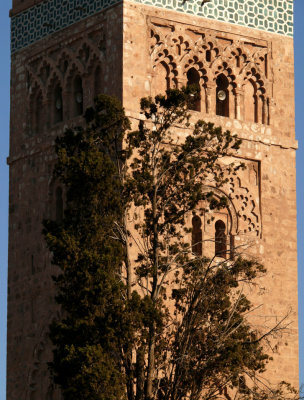 Built in the 12th Century, this minaret served as the model for the famous Giralda in Seville. I abstract the tower in two ways: by cropping the top and bottom to only show part of it, and by layering a tree over the tower, which not only abstracts it, but also adds a symbol of life and vitality to an otherwise inert subject. Half the visible tower is in shadow as well, which adds a three-dimensional illusion to the image. 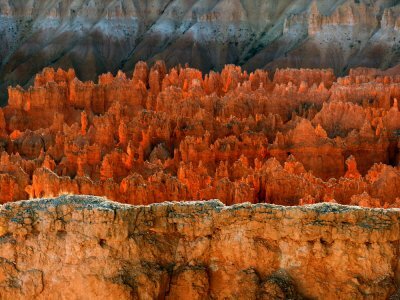 I wanted to do more than just describe the brilliant scene before me as I stood over Bryce Canyon under the late afternoon sun. These “hoodoos,” formed by the rushing waters of ancient rivers over 65 million years, are actually in shadow, yet they are glowing like hot embers because of reflected sunlight. To put that glow into context, I bracket the glowing hoodoos with two other layers. The bottom layer, my anchor, is a massive wall that runs across the middle of the canyon. The lowering sun casts its light on the other side of that wall. It is the source of the reflective light that illuminates the hoodoos. The second layer, filling half the frame, is made entirely of the glowing hoodoos. The third layer, at the back of the image, shows the shadow of the canyon on the canyon’s far wall. That is how the hoodoos would be lighted if not for that reflecting wall. 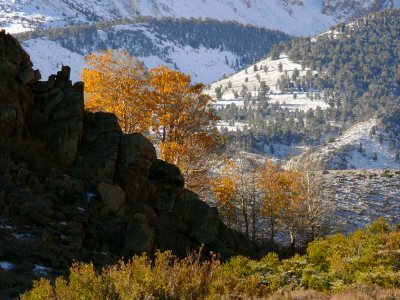 What we have here are transitions in both light and in geological history. Each band features different textures, colors, and shapes, and each tells a different story. Four layers deep, this image attempts to express a moment in time when three different seasons are simultaneously in play. 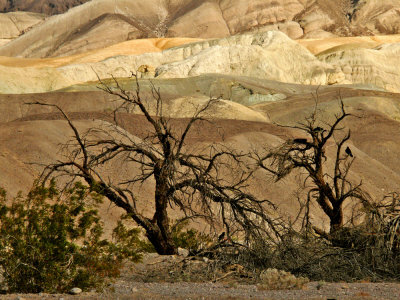 The green foreground suggests summer, while the dark rocks offer a transition to fall, which bursts into color just above them in the middleground. The entire background is made up of snow-covered hills -- terrain already in winter’s grip. Each layer flows across the image in diagonal movement. Using a long 374mm telephoto focal length, I layer this image as a series of horizontal planes. 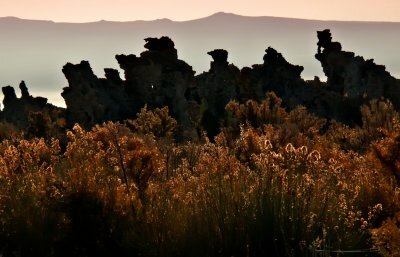 All three planes are backlighted, creating a glowing field of golden sage backed by a parade of silhouetted ancient limestone outcroppings call tufa. The mountains along the lakeshore in the distant haze provide a background layer. To someone who has been to Mono Lake, this will be a familiar image. But those who have never seen this salty, spring fed lake may well be taken by surprise to see these old rocks on parade. This structure, a virtual homage to the memory of US Route 66, is literally covered with symbols and numbers saluting its location on the “Mother Road.” In the hey-day of Route 66 it served as a motel, and is now part of a complex of crumbling buildings surrounding a popular Seligman drive-in. I compose this image as series of layers, starting with the fender and bed of a rusting pick up truck in the right foreground. (Naturally, it’s full of tumbleweed.) There is a bike somewhere in that truck as well. The diagonal thrust of the truck bed leads us the second layer – another bike, followed by a third layer detailing the amazingly decorated façade of the building itself. It is covered with tires, hubcaps, and discs spelling out the name of the historic road. As throw-ins, there are two huge “66’s” and a Coca Cola sign on the wall as well, which glows and bulges in the warmth of the summer sun. A final layer is tucked away within the windows and doors – no space is left unadorned with tributes. Glowing in the pale early morning light, Otter Rock is among the most prominent landmarks on the Oregon coast. Thousands of seabirds nest here, and it’s a favorite haulout for harbor seals. At low tide, there was enough ocean bottom showing to create a layered landscape. 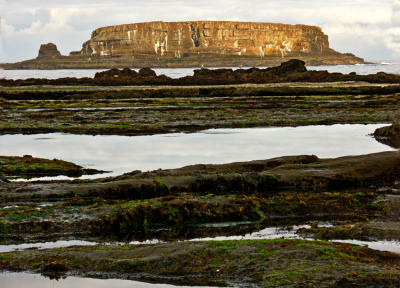 I was able to include a series of horizontal tide pools as foreground and middleground layers leading to sun splashed Otter Rock, which is spread across the background layer of the image. 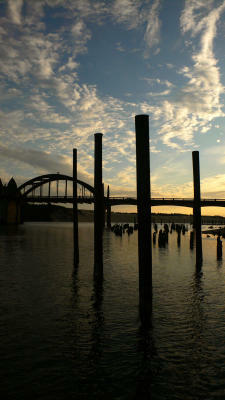 Florence is known for its 1936 bridge carrying Route 101 across the Siuslaw River. I photographed it at dusk, using a wideangle lens turned vertically to stress the huge pilings as my foreground layer, and worked the horizontal bridge in as my middle ground layer. The final layer is the soaring cloudscape, which once again returns to a vertical orientation. I call this a layer sandwich, alternating between vertical and horizontal thrusts. Even though the subject may be a still-life, these alternating layers create a set of tensions and counter tensions that energize the scene. At the heart of this market is a flight of stairs leading to the Seoul Subway. Over the steps was a large advertisement, featuring a seductive model. People were constantly coming and going around this entrance, and I was able to find moment in time that weaves its meaning through six separate layers of people. A foreground layer holds the softly focused back of a person in a purple coat. That person represents all of us. He or she sees what we would see if we were there. In the primary layer, a young man with a backpack, is trying to dodge cars as he tries to cross the street. The morning light catches his face and highlights it, making him the focal point of the image. A car enters the image at right, a surreal reflection of this young man etched on one of its windows. At far left, in a supplementary layer, a man leaves the scene – he has turned his back on all that is going on behind him. The advertisement provides another significant layer. 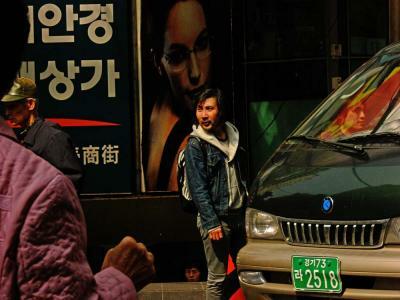 The large Korean words offer a sense of location, and the huge face of the woman fixes its gaze on the young man trying to cross the street. He does not look back at her. Finally, in the pictures final layer, the tiny face of a woman emerges from the depths of the subway. She will soon have to find her way through the crowds herself. Taken together, these layers form a street photograph that expresses the swirl of activity that surrounds this marketplace. Thanks, Roe, for this comment. I hope you will not only study this gallery, but my others as well. Layering is essential if we are to structure our images for meaning. It is so important that I am going to be adding a new gallery entirely devoted just to the role of making transitions flow between one layer and another. It should be posted shortly. Thanks again for studying my cyberbook. Your explanations are so clear that I get it..I understand what your talking about and have never thought about the term layering..I'm going to try it when I compose an image..I might fail but I'll keep trying..this gallery opened up my eyes..I love the depth of these amazing images..thank you..
Hi, Mary -- glad to know that my galleries are useful to you -- layering can be a powerful concept and I hope you will find room for it in your work. And yes, it does help to go beyond the gut, and actually think about why we are making an image, and what we are trying to say with it. Glad to help, Vera -- there are so many different ways to use layers, and I have tried to touch on most of them in this gallery. I am not sure which street photograph you are referring to here -- I have several in this gallery. In any event, layering can bring any image to life by creating comparisons, scale relationships, contrasts and subject/context placement that express meaning. And that is what makes an image seem alive, as opposed to stagnant and flat. It is the energy of meaning, created by relationships in size, space, color, placement, texture, and symbol. First, I have never thought about layering in terms of diagonals and horizontals, only verticals. Second, I have never thought of texture as a means to create layers. Much to think about here. I liked your street photograph in this chapter and the explanation as it started to click for me why street photography seems so alive. Thanks, Shirley. Layering also gives an image a sense of depth. By combining foreground, background, and middleground information, we draw the viewer right into the image. I like the idea of layering. It makes images rich and sophisticated both in color and information.